Suite Sports: LeBron vs Kobe vs MJ: What Do the Numbers Say? 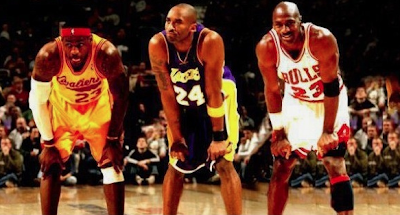 LeBron vs Kobe vs MJ: What Do the Numbers Say? Who doesn't love a good weekend argument! Here are the numbers, as best I could sort them, for LeBron, Kobe and MJ in their first 10 years in the league. Why did I pick 10 years? Because LBJ just finished his 10th season, and everyone seems very intent on placing him historically far before he's done playing. When looking at this it's important to remember that both LeBron and Kobe came straight out of high school into the association, but also that LeBron spent seven of these years in Cleveland (Two of those years on teams where Mo Williams was his No. 2), Kobe played second fiddle to Shaq for his first 8 years in the league, and MJ missed nearly all of the 85-86 season with an injury. Remember, numbers mean nothing in a vacuum! I feel like we debate this literally every week on our basketball podcast, so I wanted to lay the numbers out for everyone before we, inevitably, debate it again Sunday. Whether you're a LeBron fan, an MJ fan or a Kobe fan, you have to agree that numbers mean something, and even if you're one of those "RINGS" people, I've included championships and finals appearances, along with other individual awards as well. I'm not a total stat nerd/I didn't feel like wasting 8 hours on this, so I didn't get each player's per 36 minutes statistics/efficiency numbers, but I've broken everything down to per game, which is about as far as I'm willing to go in this argument that I don't really care about. A couple quick notes. Under the "Hall of Fame/Future Hall of Fame Teammates" I didn't count any players that were far past their prime and not playing at a Hall of Fame level. That means Ray Allen and Shaq don't count for LeBron, and Karl Malone and Gary Payton don't count for Kobe. It should also be noted that since MJ spent a year and a half playing baseball/training to battle the Monstars and save the Looney Tunes, his 10th season didn't come until he was 31. Unfortunately, our buddy Dennis Rodman didn't join the Bulls until 1995-95... MJ's 11th season in the NBA. So, after looking at the numbers and achievements, who ya got? Awards/Titles: 3 NBA Championships, 3 Finals Appearances, 3 NBA MVPs, 3 Finals MVPs, 9x All NBA (8x 1st team), 7x All NBA Defensive Team (7x first team), 10x All Star, 1x All Star Game MVP, 2x Olympic Gold Medalist, Rookie of the Year. Awards/Titles: 3 NBA Championships, 3 Finals Appearances, 0 NBA MVPs, 0 Finals MVPs, 8x All NBA (4x 1st team), 6x All NBA Defensive Team (4x first team), 9x All Star, 1x All Star Game MVP. Awards/Titles- 2 NBA Championships, 4 Finals Appearances, 4 NBA MVPs, 2 Finals MVPs, 9x All NBA (7x 1st team), 5x All NBA Defensive Team (5x first team), 9x All Star, 2x All Star Game MVP, 2x Olympic Gold Medalist, Rookie of the Year.